The majority of the tools available for browsing and searching the Web is based on extracting information from structured documents. However, as information on the Web increasingly comes out of a database, it is crucial to be able to search databases when working with the Web. Due to the highly dynamic nature of the Web, it is unlikely ever to know the underlying schemata of those databases. We remedy this situation by introducing an extension of SQL called Reflective SQL (RSQL) which treats data and queries uniformly. Queries are stored in specific program relations and can be evaluated by a LISP-like operator called eval. 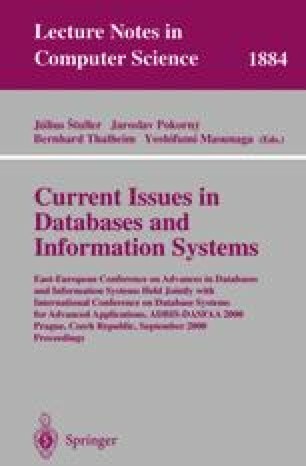 Program relations cannot only be constructed for given que ries, but their contents can also be generated dynamically based on the current contents of the underlying database. RSQL serves as a basis for a keyword-based search which renders it possible to formulate queries to databases in the absence of schema-knowledge. It is shown how this language can be exploited as a Web search engine that works on databases instead of documents.